Right before I went vegan, I made the best lasagna I had ever tasted. It was called Pesto Lasagna, and it contained eggs and three kinds of cheese. It was so rich and creamy that I never tried to recreate it as a vegan because a cheeseless, low-fat version seemed impossible. I’m not usually one to shy away from tackling the impossible, but I didn’t want to tamper with the memory of a meal that had grown to mythic–and probably unrealistic–proportions over the years. But this week I decided not only to take on the pesto lasagna of my vegetarian days but also to do something I never would have dreamed of doing back then: substitute the noodles with spaghetti squash for a lighter, gluten-free, but still rich and creamy lasagna. And I’m so glad I did! But before there was success, there was failure. My first attempt never really got past the spaghetti squash stage. I had bought a small, 2-pound spaghetti squash at the farmers’ market, and I roasted it, as I’ve done in the past. But when I cut it open, the insides were a wet, clumpy mess, not the individual strands of gold “spaghetti” I was expecting. I couldn’t even separate the seeds from the flesh because it was all one sodden pile of mush. 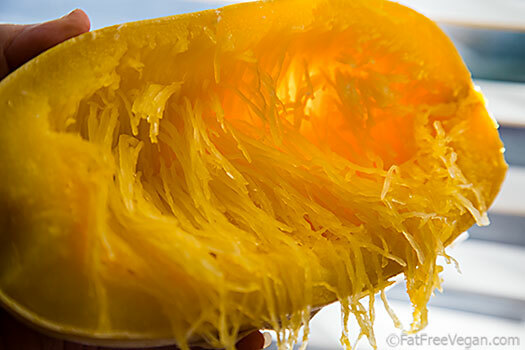 I must have cooked it too long for its size, but that’s the problem with cooking a spaghetti squash whole–you can’t check it to determine when it’s done. For my next attempt, I decided to cut the squash in half before cooking so that I could check its doneness. I went down to the grocery store and bought a medium-sized squash, a little over 3 pounds. I didn’t want to wait the hour it could take to roast the squash, so I decided as a short-cut to pressure cook it instead. I fitted my electric pressure cooker with a gadget I’d just bought, a silicone steamer basket, added a cup of water and the two halves of the squash, and then set the timer on high for 8 minutes. I figured that if it needed more time, I could always add another minute, but when I checked it, the squash was perfectly cooked, tender enough that I could scrape out the golden strands but not turning to mush. The squash turned out perfectly and so did the lasagna. My husband raved at how good it was and told me that, frankly, he hadn’t been optimistic about spaghetti squash instead of lasagna noodles. But we both loved the creaminess of the sauce and filling which contrasted with the slight crunch of the “noodles.” And the fresh basil gave it a fresh, peppery zing. It was a complicated dish to make on a weeknight, but I’ll definitely make it again. The cashew cheese sauce gives this lighter lasagna its richness, but you can cut the fat by 2 grams per serving by leaving out the cashews. Cook the spaghetti squash. You can bake it, microwave it, or do as I did and pressure cook it. To pressure cook, cut the squash in half and scoop out the seeds. 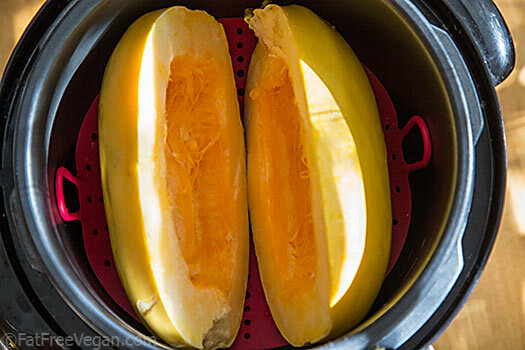 Place a steamer basket in your pressure cooker, add 1 cup of water, and place the squash halves in the basket. Seal pressure cooker and cook at high pressure for 8 minutes. Release pressure, uncover, and allow the squash to cool until you can handle it comfortably. Heat a medium-sized sauce pan. Add the mushrooms and 1 clove chopped garlic, along with 1 tablespoon of water. Stir and cover tightly. Cook, stirring every 60 seconds, until the mushrooms soften and exude their juices, about 3 minutes. Uncover and cook until most of the liquid evaporates. Season lightly with salt and pepper, if you like, and set aside. Make the filling: Start your food processor and drop in the 2 cloves of peeled garlic. Process until finely chopped. Add the remaining filling ingredients and process until smooth, stopping to scrape down the sides of the bowl if necessary. Set aside. Make the cheese sauce: Place all ingredients into a blender and blend until completely smooth. Assemble the lasagna: Spoon about 1/4 cup of the spaghetti sauce into the bottom of the dish, just enough to coat the bottom. Spread half of the spaghetti squash over the sauce, and sprinkle with salt and pepper if you like. Drop the filling over the squash by large spoonfuls and then spread it out evenly. Arrange the mushrooms over the filling, followed by the spinach, if you’re using it. Pour half of the cheese sauce over the spinach and mushrooms. Add the remaining squash, smoothing it into an even layer. Pour the remaining spaghetti sauce over the top. Bake for 15 minutes. Then carefully, starting in the center of the pan, pour the remaining cheese sauce over the top, being careful not to splash the sauce onto the hot pan. Return to the oven and cook until the lasagna is bubbling all around the edges, about 30-40 more minutes. Remove from oven and allow to stand for at least 15 minutes–the sauce will thicken and the lasagna will be less watery the longer it stands. Serve warm. Since spaghetti squash doesn’t have the starch of lasagna noodles to absorb and thicken the sauce, some liquid in the bottom of the pan is normal. But the lasagna will get firmer the longer it stands uncovered, so you can make it ahead of time and reheat it before serving. I’ve been cooking your recipes for a few years now and this one is at the top of my list! It was fantastic. I almost didn’t make it because I do NOT like soggy anything, but I found that gently pressing the squash between some paper towels got rid of all the liquid. It came out perfect! great idea to press the squash! I will be doing that! I made this last week and it was amazing. My husband loved it and it was great as left overs the next day! I think next time I might add more basil. I made this last week and it was so amazing! This week I didn’t have any tofu and replaced it with polenta and it was still delicious! I have no experience with cooking polenta. How do you prepare it for this recipe? I just made this and WOW, it is so yummy!! The tofu-basil filling really tastes like the ricotta filling in lasagna. Delicious! This was delicious even with my nightshade-free pasta sauce substitute! I have my own recipe for a pumpkin sauce that I’ve been using since I haven’t been able to eat nightshades for just over a year. LOVED this. I’ve been an avid reader (stalker?) for years and don’t know if I’ve ever commented on a recipe before, but I just had to say thank you for this gem. My husband and 3 year old son gobbled it up too, and it got even better after one or two days in the fridge. Also, I’ve always failed at spaghetti squash in the past, your pressure cooker idea worked perfectly! Thanks again for all your great recipes and keeping me inspired in the kitchen! I made this tonight and it is a total winner! This is going to be a regular part of my recipes for sure! Perfect! I’m having omnivore company tomorrow and my go to is always a yummy vegan lasagna. But this time I’m really watching my calories and since I know dinner will include my husband’s homemade french bread and a key lime pie for dessert, I didn’t want the main dish to be so carb dense. Spaghetti squash! Perfect solution! I’m considering also making separate pesto and stirring it together with the squash to give the squash itself a little more flavor, since it can be bland. Thanks for the excellent recipe, as usual! I love your recipes and this one looks fabulous. Since I live alone, I cook in quantity and freeze most things. Have you ever frozen this recipe? Results? Would you do it again? I haven’t frozen it, so I can’t say how it would do. But if you try freezing it, I’d love to know the results. 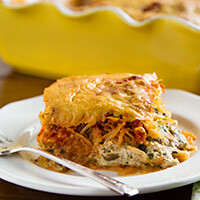 I just made the spaghetti squash lasagna and it is DEEE-licious! I used my new pressure cooker for the squash and it worked well, although I had to add a couple of extra minutes cooking time. I used a whole jar of marinara sauce (I like lots!) and also added Field Roast Italian seitan sausage; the sausage is good, but next time I will leave it out to keep the fresh veggie flavors in the foreground. The tofu filling and cheese sauce are amazing! I will use them with traditional noodle lasagna, too. Thank you, Susan, for yet another fantastic recipe! Can’t tell you how this lasagna freezes yet. I had 2 friends over for dinner last night and served the lasagna. I thought it was delicious and my guests thought so too. No leftovers and the plates were licked clean. I now have a new favorite entree. I absolutely love spaghetti squash, I was looking for a vegetarian dish for this evening (my attempt to do a Meatless Monday) and to use up the squash I bought last week. I just made this recipe and it’s FANTASTIC. So much I had to come and let you know. I am going to make this again and have already notified a few of my vegan friends. Definitely a bit of work for a weeknight meal, but so worth it. 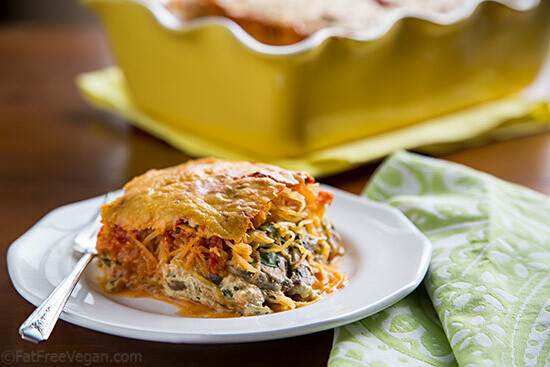 Has anyone made this lasagna in an Instant Pot??? I first saw this recipe on my facebook feed and thought it looked delicious and then I made it, and it was more than delicious, it was stupendous, amazing, out of this world :). I can’t eat mushrooms so I put in asparagus and it was great. I love this lasagna, you don’t even miss the noodles, and it’s just yummylicious. I am so happy to have access to your website, I haven’t tried a recipe I haven’t liked yet. Keep up the great work and thank you. This looks so delicious. Have you ever made it with dry basil? I’m not sure if I can find basil fresh right now. If I can’t, how much of the dry basil should I use? I haven’t made it with dry basil and worry that it won’t be as tasty, but you could try adding it to taste. This sounds wonderful. I’m inviting a friend over this weekend who is considering going plant based. I wondering if I made an extra dish would the squash freeze well or turn into a soggy pile of mush? This recipe is INSANE!!! I have loved every recipe of yours that I’ve ever tried. But this one knocked it out of the park. We ate almost the entire pan. Kids loved it, husband loved it, we all love it, and it’ll be made many more times. Hi Sue, First of all. Thanks for being a blessing. I appreciate the way you share, telling us about your pets, allowing us to seem them, cats etc.,. I love your recipes and the way you explain and share as well. I am faced with a situation on this Island, in that we do not get certain food items here, such as potato starch, and Seitan, and other items, so I miss out in making the lovely, tasty looking dishes. One day Lord willing I will meet you and family in God’s time. Love and hugs. Abi. Thanks so much for sharing this recipe online. I’ve been following Dr. Fuhrman’s Nutritarian style for a little over 9 months now and am still looking for dishes that meet the nutritarian criteria but can still be delicious. 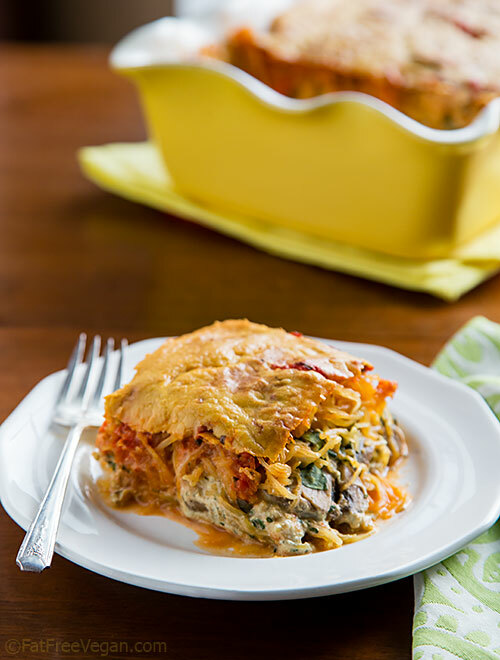 This is delicious, filling, creamy and seems like comfort-food! After making this tonight, it is one of my new favorites and I can see it being in our regular rotation for sure! Again, THANK YOU SO MUCH! I made this tonight and it was really delicious. My 17 year old son said that it was surprisingly good. I don’t think he knew what to expect when he noticed there were no lasagna noodles and spaghetti squash instead. I’ll definitely make this again. Thanks! My gosh! This was absolutely amazing! Tastes so good it makes you think its bad lol my sad eating 20 year old went back for seconds! I am definately making this again and doubling the recipe. The only thing i did different was i added red peppers and onion to the musshrooms step. Thanks for creating delicious healthy recipes!! I haven’t tried it, but I would worry that freezing would make the squash mushy and cause the casserole to be too liquidy. making it now, my cheese sauce is just liquid, what’s the deal? Is it supposed to be thick? It thickens as it cooks. One teaspoon of salt? Isnt that alot of salt, and wont it over power the sweetness of the basil? It’s just a suggested amount, but tofu is very bland and salt improves the flavor. I made this last night and it was amazing! I think I overcooked the spaghetti squash but I really liked it that way. I released the pressure right after it finished but I was busy with other things so I left the squash in the Instant Pot for about ten minutes. My strands were sort of mushy but they came out the squash effortlessly. I sort of pressed them into the pan with the spatula to make a nice base. I was amazed at how perfectly the lasagna sliced up and made it to the plate. It was very firm even though I was too impatient to wait more than about fifteen minutes to serve it. It is so good. It is less filling than lasagna made with noodles, of course, so I recommend generous portion sizes! I will definitely be making this again and again! Thank you! This recipe is amazing. I will make this again and again. I roasted the spaghetti squash in my slow cooker. This is a huge time saver. Just poke a few holes in it — you don’t need to cut the squash in half — and place it whole in the cooker. I roasted it on high for 3.5 hrs, and though I think it was cooked enough after 2.5-3 it was not overcooked. I cut it open and let it cool until I could handle it and then scooped the seeds; then after scraping it into the strands I let it sit for awhile in a collander. It was perfectly cooked for this recipe and I didn’t have too much liquid in the lasagna. The flavors in this dish are perfect. It also looks pretty. I can’t wait to make it again. I’m making this right now (it looks soooo good! ), but the cheese sauce came out ay too thin, not at all like your picture. I’ll just add more cashews, but are the quantities right? I’m using cashew milk. Have you already cooked it? It looks thin but should thicken during cooking. Not cooked yet, so I’ll give it a try and see how it turns out. Thanks for the quick reply!!!!! Does anyone have suggestions for replacing the cashews in this recipe? My husband is a strict vegan for health reasons and my daughter has a very severe cashew allergy. As you can imagine that makes “cheesy” vegan dishes less accessible. The kids and I love, love, love cheese and we would still like to make this dish. Would almonds work? I understand it may not taste as cheesy, but would it be good, do you think? Other ideas are very welcomed! If your daughter can eat sesame seeds, try using 2 tablespoons of tahini instead of the cashews. Just made this and it is AMAZING!! Why would anyone eat meat when real food can taste like this!! Thanks so much!! Really want to make this for new years, but my nephew is allergic to tree nuts and peanuts. What could I use instead of cashews? Thanks! Sorry I just saw the content about sesame seeds. Never mind! I’ll let you know how it turns out. I’ve also heard that sunflower seeds/butter are also good substitutes. Wonderful flavors and texture! A bit too much salt in the filing, but otherwise the recipe was spot on! This is the first time I made something from this site and I’m so glad I did. I’ll be making the blueberry banana bread using GF flour next. I’m very happy I found this site since eating low fat, plant-based whole foods. Thank you Susan! My first time trying one of your recipes… loved it! Low fat and vegan was what I was looking for…. this recipe fit the bill. I made it exactly per the recipe and will definitely be making it again. I can hardly wait to experiment with more of your recipe creations. Thanks for sharing!! !